Positioning oneself as a challenger to Telangana Rashtra Samithi (TRS) president K. Chandrashekar Rao is never an easy job. The Telangana chief minister is a brilliant orator and is blessed with great political acumen. But Uttam Kumar Reddy, a retired Air Force pilot who leads the Congress in Telangana, loves a good fight. A former minister, Reddy is close to the Congress high command. Even when many of his fellow Congress leaders went soft on KCR, Reddy continued to be critical of the TRS government. He played a key role in the distribution of tickets for the assembly elections and also in forming the People’s Front, an alliance of the Congress along with the Telugu Desam Party, the CPI and the Telangana Jana Samithi. Reddy has now emerged as the face of the opposition in Telangana. His ‘praja chaitanya bus yatra’ has been hugely popular. He is also active on social media. 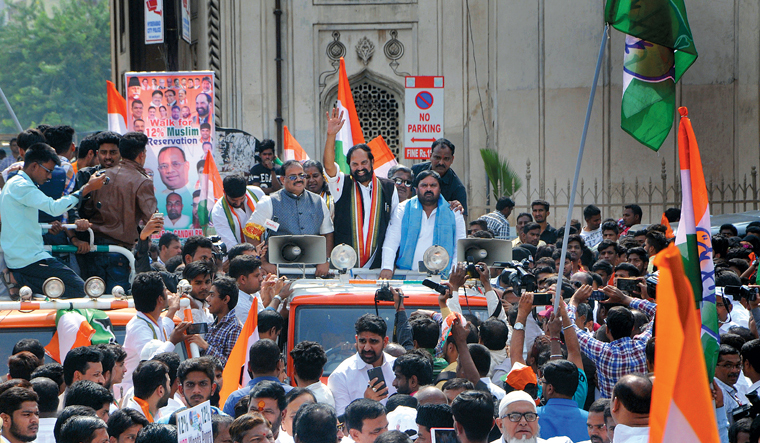 In an exclusive interview with THE WEEK, Reddy says he is confident about the Congress-led front winning a majority in the assembly elections. The Congress and the TDP have been rivals for more than three decades. How confident are you about vote transfer between the two parties and the success of your coalition? Political forces tend to realign based on present, realistic circumstances. Today, the TRS government is cheating the people of Telangana and is trying to suppress their human rights. The Congress, the TDP, the TJS and the CPI have got together to protect the people of Telangana from the misrule of K. Chandrashekar Rao. And, we are 100 per cent sure that the vote transfer will take place. The TRS government has issued dozens of confidential government orders since 2014. At one point, it even closed down the website that publishes the GOs to prevent people from accessing those. If your party comes to power, will you make those GOs public? Yes, of course. Against all rules and the Right to Information Act, the Telangana government has kept the GOs a secret. Why should they be a secret if there is no corruption or wrong intention? You have spoken about giving up politics if you fail to come to power. I have to take the moral responsibility if the Congress does not win the elections. TRS leaders allege that Andhra Pradesh Chief Minister Chandrababu Naidu is running the show, and has struck a deal for the TDP to take over the home and revenue portfolios if you win. This is a rubbish propaganda being spread by KCR. Everything that the next government will do will be in the interest of Telangana. You have been talking about rampant corruption during the TRS rule. Will you order an inquiry if you come to power? There will be an inquiry and there will be action as per procedures and regulations. The TRS says the law and order situation was worse under the Congress rule. This is again bogus propaganda by KCR. For many years, Hyderabad has been peaceful and it continues to be peaceful. The credit for this does not go to them or anyone else. TRS leaders are asking the voters not to vote for the Congress calling all its leaders corrupt. The most corrupt chief minister in independent India is K. Chandrashekar Rao. His party has resorted to systematic ways to amass illegal wealth. The whole state is in the grip of one family. This is not good for democracy. They don’t have the right to talk about corruption. Do you think the Congress rebels will play spoilsport? Most of the senior rebels have withdrawn. In a few places, there are some insignificant leaders contesting and it will not make any difference. You and your wife are contesting. Why is the one-family, one-ticket rule not applicable to you? Since my wife is an MLA, she got renominated. The rule does not apply to sitting MLAs or those who are already in politics. Your comments on the welfare schemes introduced by TRS? The only welfare that has happened is that of KCR and his family, and nobody else. Only four people among four crore people of Telangana have benefited from the TRS government. The people of Telangana know about this well. What are the areas that you will focus if you come to power? Generation of employment, giving viable remunerative minimum support price for agriculture produce and empowering women’s self-help groups will be our top priority.